"Using this technology, I've been able to see and understand processes I probably would have missed by just looking at two-dimensional plots of the data," says van Keken, an assistant professor of geological sciences. His research focuses plate tectonics and the dynamics of the mantle, the plastic-like layer between Earth's crust and core. A specific area of interest is understanding mixing in the mantle, which is essential in piecing together a picture of Earth's chemical evolution. Van Keken says the virtual reality visualization approach has benefits not just for individual researchers, but also for interdisciplinary teams whose members may have different backgrounds and vocabularies. As virtual reality becomes more widely used and more researchers have access to CAVEs or 3-D graphics workstations, team members in different locations will be able to see and manipulate the same images at the same time. Already, the software that van Keken uses allows a long-distance collaborator to "visit" the CAVE by inserting a representation himself or herself in the image being viewed. The virtual visitor can then walk around and point out features in the image just as the real researchers in the CAVE can. Because room-sized CAVEs are still expensive and rare, van Keken and colleagues design their visualizations so that at least some features can be viewed on regular desktop computers. 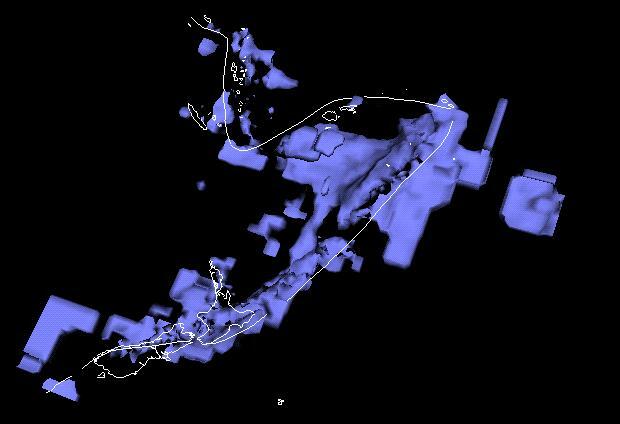 For example, they use advanced visualization and virtual reality techniques to help students see how the spatial distribution of earthquakes relates to forces along the edges of the sections, or plates, that slowly move around on the mantle. "The first time I visited the CAVE and used this immersive technology, I felt I became part of my own models and data rather than being a remote, outside observer," says van Keken. "It can provide a fundamental shift in the way we approach understanding the dynamical structure of the deep Earth, which is inaccessible to direct investigation." Additional information on the use of visualization and virtual reality in the geological sciences may be found at http://www.geo.lsa.umich.edu/~keken/VR.